Communication agency to increase your fame! 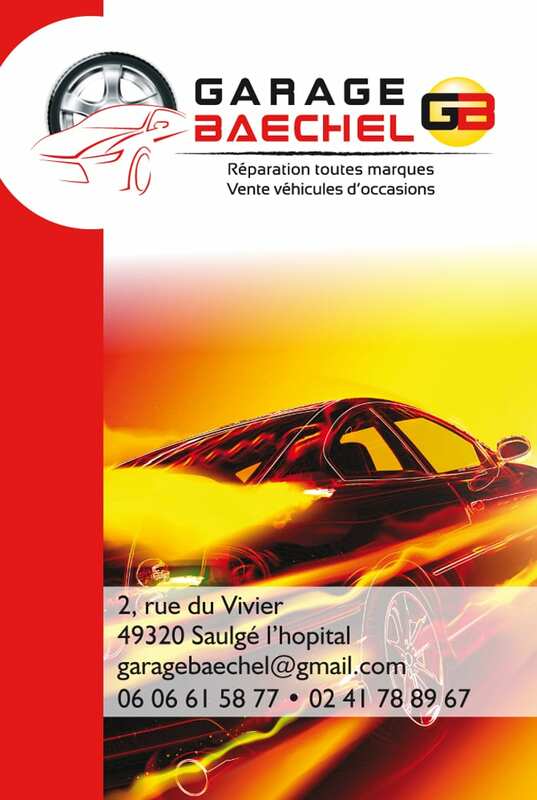 Our studio, Desjeux Créations provided a full service design for Garage Baechel, covering all their advertising requirements when the business opened in Saulgé l'Hôpital. We used our graphic design expertise to produce the logo and style guide, which was then used on the garage's marketing collateral: flyer, sign and vehicle wrap. A specific and complete answer for your needs in communication. 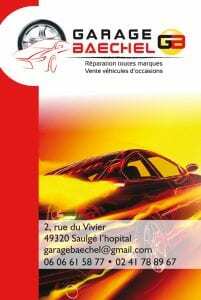 We realized for the Garage Baechel (Saulgé the Hospital - 49320) its whole communication. 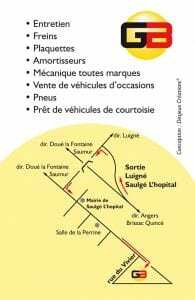 In phase of creation, the wish of the garage is to increase its fame and its image locally to develop his clientele. 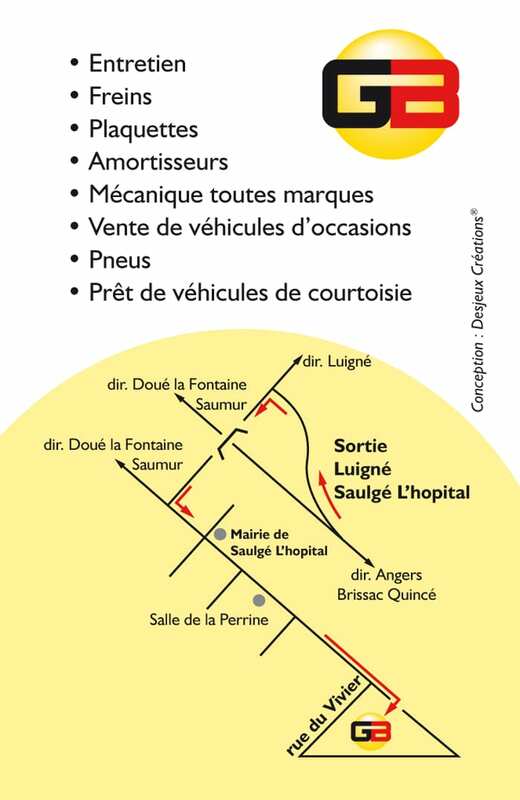 To answer this problem we defined the communications strategy of the garage, through the analysis of the context and its competitive environment. We also organized into a hierarchy its targets and defined a message for each of them. Finally we realized the communication plan through the creation of communications tools adapted to answer the problem of the garage. In the opinion of Olivier Baechel: " The communication is magnificent and the work is very well-kept. Thank you for the irreproachable work of your studio. You are really tuned in to my request. You understand at once what I wish, what facilitates our exchanges a lot. And even if sometimes I raise questioning and I come to criticize your work to find you always solutions to my problem. Then bravo for your work and thank you for accompanying us for more than 5 years maintaining on our communication so professional as associative ". Our communication agency answers your problem of image with the ambition to integrate your company, association or administration, into its competitive environment, to give him a recognizable image by his public and an identity different from the competition. To build with you a strong identity: yours! Our work, on a daily basis, is to accompany you, on the long term in the construction of your image. The communication of your company, your association, your NGO (NON-GOVERNMENTAL ORGANIZATION), or your administration... passes by a process of listening and broadcast of messages and signs bound for public private individuals. Our expertise and our know-how aim at improving your visibility, at strengthening your relations with your customers and partners, at favoring the promotion of your products or services and at defending your interests in front of the competition and of the threats of your business sector. Our common synergy passes by an essential element for us, the dialogue and the exchange throughout the process of communication. This exchange on your business, your impressions, your comments, your remarks and our expertise in communication, is going to allow us to build together an image strong in adequacy with your expectations. Our communication agency accompanies you on your communications strategy and on the implementation and the realization of your communication plan. 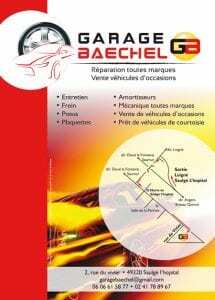 Share the post "Garage Baechel"